I’ve been watching these tulips fade and droop on my counter, intending to paint them every day, but with piles of grading to do, I just haven’t found the time. School is keeping me way too busy. Today I set aside the pile of projects for a bit, and picked up my iPad for about an hour. I’m happy I found time to draw these gently swooping stems, even if it was using Procreate instead of watercolour. This will have to do for now. I’m just back from Savannah today, and in uncharacteristic style, all my sketches are already scanned. It was a great week in the city, the workshop went really well and before school starts up again tomorrow, I thought I’d do a little summary of the week. I had a few days on my own to sketch and plan the workshop before we started on Wednesday. The plan for the three day event was to sketch every morning and every afternoon in a different square, and try to capture something unique about each place. 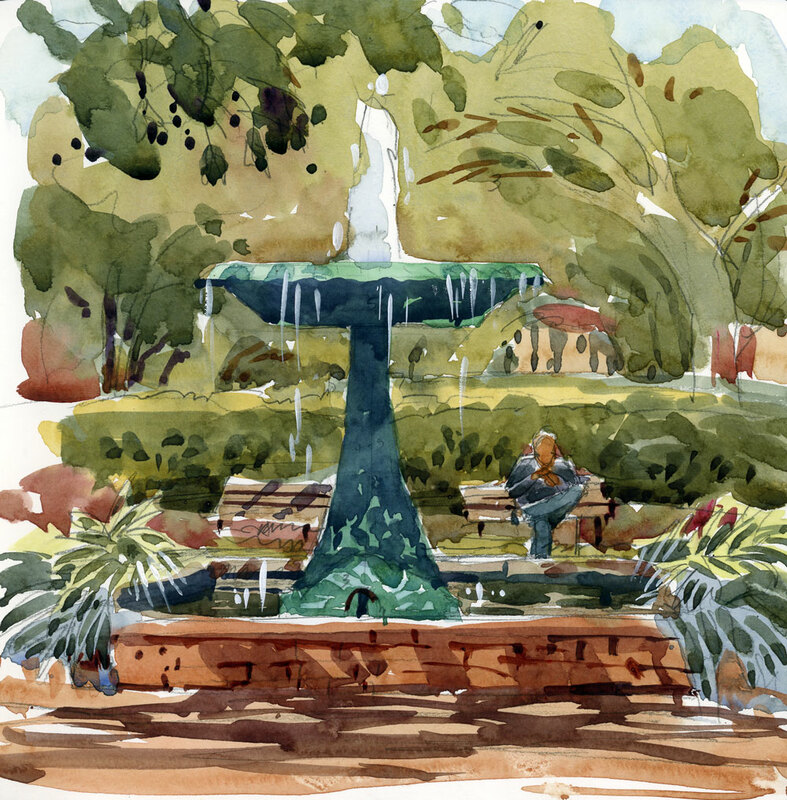 I’ve already posted my sketch of the fountain in Franklin Square, but here’s the scanned version. I also spent an afternoon in Reynold’s Square. 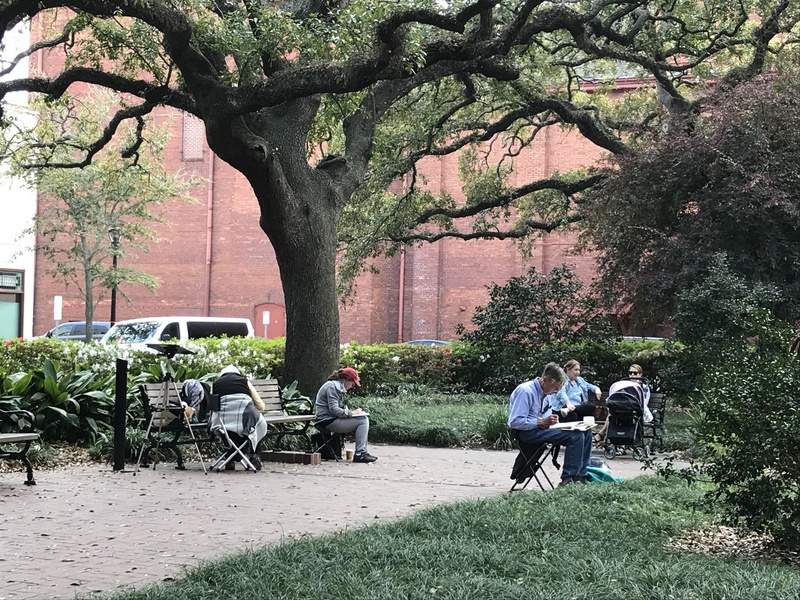 This is a great place for people sketching since lots of walking tours start here, and there are often groups hanging around waiting for their guides. A central feature of the square is a statue of John Wesley, founder of Methodism. The head and hands on the statue are oversize, making it really hard to draw, both for me and for my students who struggled with it later in the week. The historic Owens-Thomas House is located across from Oglethorpe Square. The morning I sketched it, my hands turned blue from the cold and the wind. In fact, it was unseasonably cold the whole week, but that was really the coldest day. When I look at the sketch now, it seems fuzzy and lacking details. I attribute that to my frozen hands. After warming up that day, I dragged a chair out of my rental apartment and sketched the view down East Jones St. 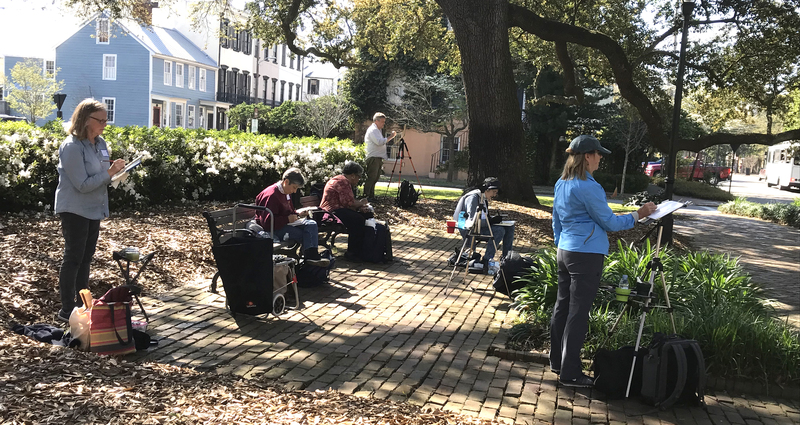 I found a sheltered spot to draw the shaded sidewalk that’s between the lovingly maintained historic houses and the strip of tended gardens in between the sidewalk and the road. My workshop demo on the first afternoon was the fountain in Columbia Square. The lesson was about values, so naturally the dark fountain and falling water set against a backdrop of trees was a perfect subject. On the second day of workshop we met in Franklin Square, facing the First Baptist African Church. I was sketching the morning light and shadow on the facade of the church when the doors opened and a woman in a blue shirt and red pants came out. I quickly added her in to my sketch, but didn’t manage to capture her leaning pose very well. She really didn’t look that short! On our final morning of the workshop we drew a series of small vignettes in Wright Square. 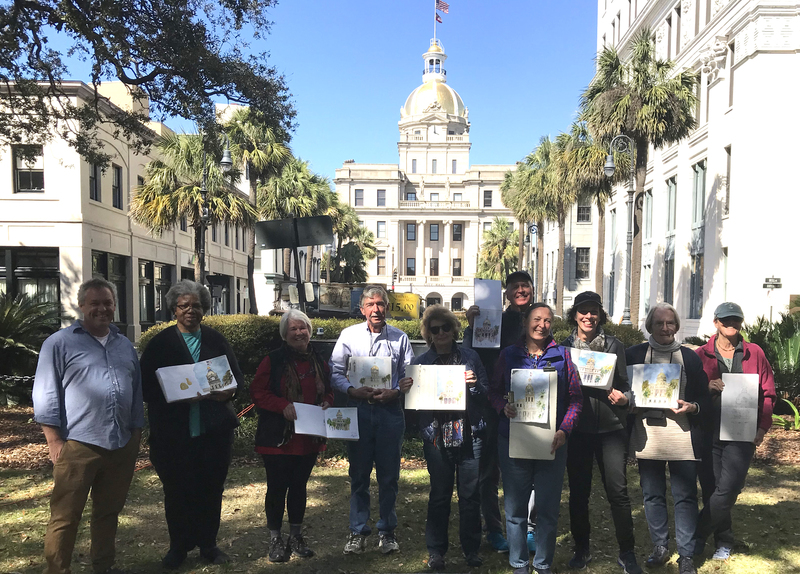 There’s no shortage of things to draw in each of these locations — from lampposts to signage to flowers —and it was interesting to see what each participant chose to capture the feeling of the square. 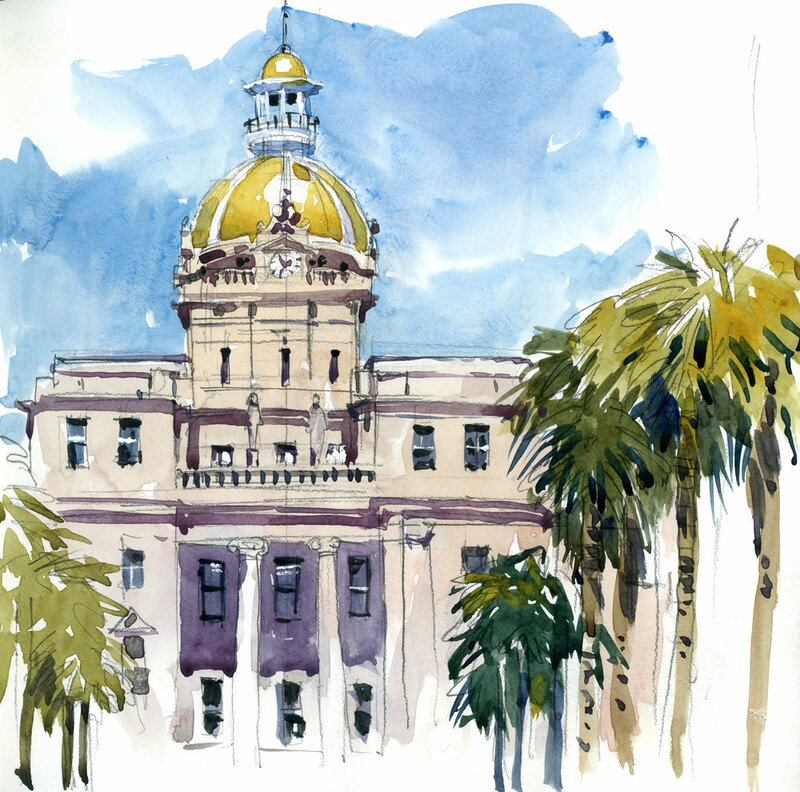 My last demo was the sunlit dome of Savannah City Hall, seen from Johnson Square. It was a good challenge for our final afternoon, and the sketches that everyone did of this were superb. Savannah was as amazing as I hoped it would be for a workshop. The city squares offer plentiful shade, spectacular landscaping, endless views of architecture and a non-stop parade of people. Luckily the weather cooperated too. When I’m teaching I often forget to take photos but I did manage to get a few of my students in the different squares. Thanks to all of you for working so hard!! Savannah had a bit of a slow start today. Seems like most of the city was still asleep when I went out sketching this morning, no doubt recovering from the St. Patrick’s Day Parade, which happened on Saturday. Around noon I started to see a bit of foot traffic walking through Columbia Square where I sitting, people still wearing green wigs and beaded necklaces, but probably looking a little less fresh than yesterday. 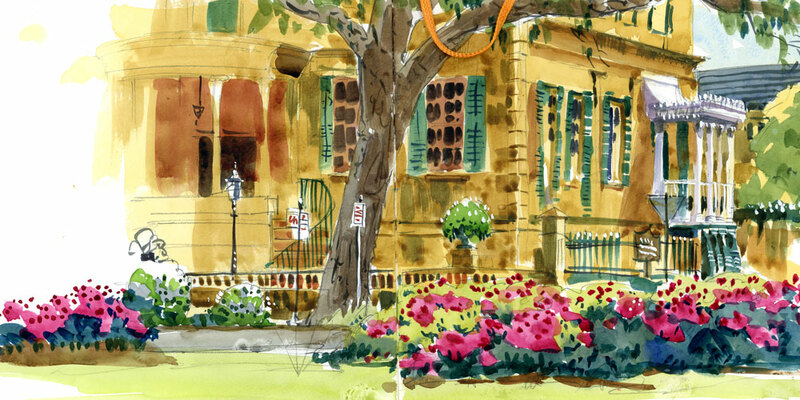 I’m here this week to give a workshop at the Telfair Museums called “Sketching Savannah’s Historic Squares”. This is my third time in the city, but first time teaching here. So excited to have the opportunity to do this in a city that is made for sketching. I would love to be able to sketch all 22 historic squares but that is a bit ambitious for a workshop week. In fact, if you want to do justice to these beautiful urban spaces you would have to sketch each of them from four sides because most of them have a beautiful central feature like a statue or a fountain, and are always flanked by architecturally amazing houses or churches. I’d have to stay here for a month or two to complete all 88 views! 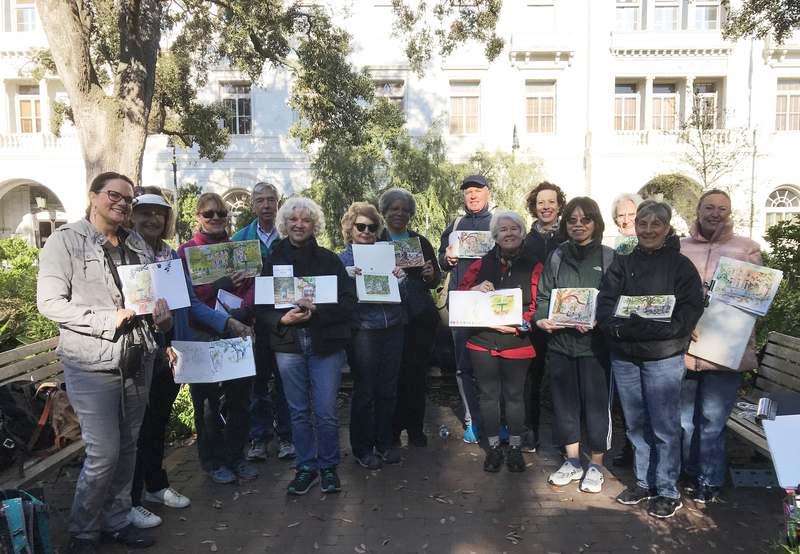 It’s been ages since I sketched people, and since the third annual “One Week 100 people” event is coming up in April, I decided to go out to do some quick people sketching this afternoon. Equipped with my 3.5″ x 5″ Stillman & Birn Beta sketchbook, a pencil, and a small watercolour kit, I headed to the mall, and for the price of a Perrier, I spent about 20 minutes sketching from a little café. The sketches are mostly of people walking by, but also some on a bench across the way, and one quick portrait of a man in the café who nodded his acknowledgement when I asked if I could draw him. One of the things I like the most about this annual event — besides the fact that it forces me to draw lots of people — is that it gets me out of my usual drawing spots (my house and car) and puts me in the midst of moving bodies. I love the social aspect of it too, because over the years I’ve learned that most people don’t mind being sketched. I often show them what I’m doing and that starts a conversation. It’s rare to find an unwilling participant when I tell them what I am working towards. 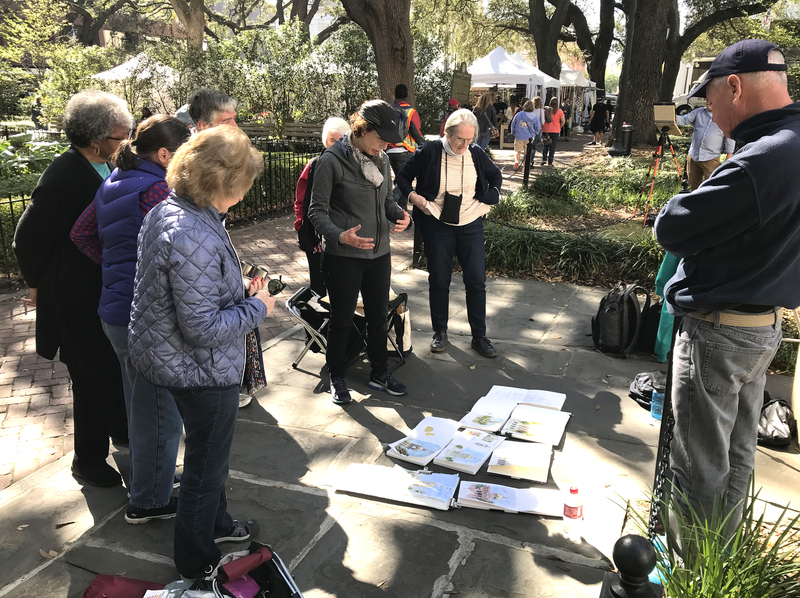 If you want to get more people drawing practice, and are planning on attending the Urban Sketchers Symposium in Amsterdam this summer, you might want to register for a one-day pre-symposium event called “People Mania: Draw at the Beach” with Marina Grechanik and Suhita Shirodkar. Both of these sketchers make people drawing look easy, and I think it’s going to be a really fun event. I’m very excited to be returning to Chicago this spring to teach at the Chicago Sketch Seminar. If you don’t know much about this event, the organizers call it a Symposium-like experience but on a much smaller scale. 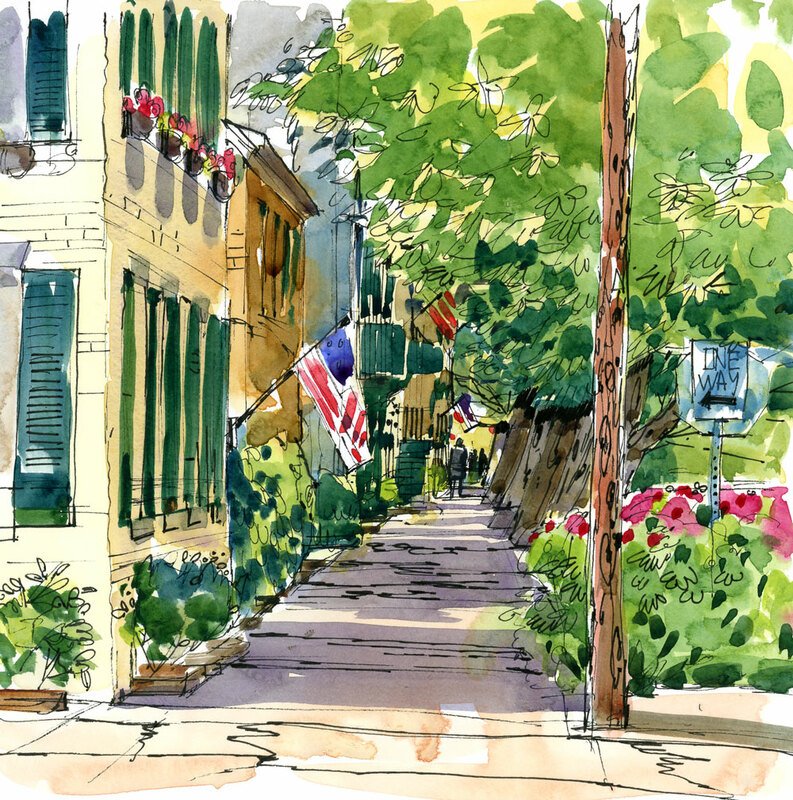 This year there will be 18 workshops, designed for all levels of sketchers — beginner to advanced — and the home base for the three-day event is the American Academy of Art on Michigan Avenue. 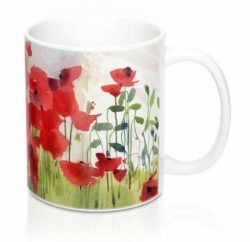 My workshop is called “Bare Bones: Exploring Limited Palettes in Watercolour“. It’s a workshop that I first taught at the Urban Sketchers Symposium in Manchester, UK, in 2016. This time we’ll be exploring new ways of working with colour, with the beautiful skyline of Chicago as inspiration. Dates of the Seminar are May 31-June 2, 2019, and registration opens this Saturday, March 16 at 10 am CST. With limited palettes on my mind, I went out sketching in Pointe Claire Village today. The warmer weather is on the way and the snow is melting quickly. I wanted to sketch the watery reflections of the traffic signs in the wet street but a car parked in front of me after my drawing was done so much the colour was done from memory. Limited palette was Cerulean Blue, Cobalt Blue, Quin Rose and Quin Gold.